Expectations are tricky. As genealogists, we should always be on the look-out for new information, recognizing that the data sought may be in a different location, or format, or offer different content than we had expected. Lately, as I’ve mentioned, I have been playing around with Google searches. A few days ago, I thought I might look for information about my maternal grandfather’s father, a man I’ve grown used to knowing very little about. His name was John Frank Bell (1878-1944), and he managed hotels in Norfolk, Virginia. He was married twice, to my great-grandmother Minnie Estelle Jackson (1876-1935) and to a woman my grandfather always referred to as Marjorie Feller. In my previous research on this second marriage, I had found a woman who seemed to fit the bill, a Marjorie Feller Jarman (1899-1995) who was twenty years Frank Bell’s junior and actually outlived her stepson, who died in 1994. My expectations were low as well as set, and yet what did I find? I found ads for J. Frank Bell as manager of the Hotel Fairfax (“Absolutely Fireproof”) in The Official Hotel Red Book and Directory for 1920; reminiscences about Frank and the American philosopher Elbert Hubbard from a 1977 letter written by my great-aunt and published in the Long Beach (California) Independent; Frank’s obituaries in The New York Times (“Virginia Hotel Man was Civic Leader in Norfolk”) and Virginia Beach News; and references to his role in founding the Norfolk Rotary Club and to the offices he held in the Southern Hotel Association. The obituaries included the note that J. Frank Bell was survived by a widow, Mrs. Margaret Feller Bell. A Google search for her (as “Mrs. J. Frank Bell,” “Margaret Feller Bell,” and “Margaret Feller”) yielded the surprising information that my step-great-grandmother was a public figure in her own right, a professional singer as Margaret Feller Stegall and later the music director of the Galilee Church Choir in Virginia Beach. A subsequent search at Findagrave.com gave me new – and more plausible – life dates for Margaret (not Marjorie) Feller Bell (1884-1954), making her only six years younger than her husband. As Penny Stratton pointed out in her blog post on the pluses and minuses of family stories as the basis for genealogical research, I must now subject my grandfather’s story to more rigorous standards of proof. There are other Fellers buried at Forest Lawn Cemetery, so my next order of business is to go to the 1930 and 1940 Virginia censuses to see if Margaret has any other relatives buried with her – and with my great-grandparents – in a family plot or plots in Norfolk. In my own research, I would be all about documenting the life and times of my great-grandparents, and only interested in the second wife as she informed me about my great-grandfather’s life. Her being a public figure and a singer is of interest. Her family not so much. Richard, I think information about her family might then inform me about my great-grandfather’s life. 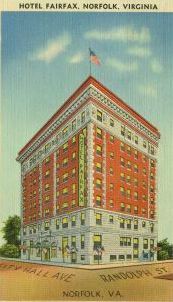 I think it’s always useful to know about the context in which our ancestors lived, and as I learn more about Margaret — “mezzo-contralto; soloist Freemason Street Baptist Church and Chef Sholem Synagog [sic]; teacher of singing at Feller Vocal Studio [with her brother and sister-in-law]; address, Southland Hotel” — I am learning more about the Norfolk my great-grandparents experienced almost a century ago. Mr. Steward: I would love to get in touch with you. Your great-grandfather John Frank Bell (actually John Francis Bell, Jr.) was the younger brother of my husband’s great-grandmother, Delia Harrison Bell (Snead). Their parents were John Francis Bell and Isabelle Phillips. I have a lot of material on Isabelle’s ancestry (35+ years of research), but the parents of John Francis Sr. are a long-standing brick wall. Your post was very encouraging. Scott, here’s a little tidbit I came across recently. This is great, Randy, thanks!